IT'S NO great surprise to that Collingwood boasts the best midfield in the League. With Brodie Grundy's handy work, tapping it down the throats of Steele Sidebottom, Scott Pendlebury, Adam Treloar and in 2019, Dayne Beams, the Magpies' engine room is going to be fueled up and ready to go. Premiers West Coast made the top five, while the Hawks – with Brownlow medalist Tom Mitchell – have been ranked in the middle of the pack. As most would probably expect, Gold Coast languishes at the bottom of the rankings, although with Lachie Weller, Touk Miller and David Swallow, they have the nucleus of a good midfield they can continue to build around. BEST FORWARDS? Where does your club rank? BEST DEFENCE? Where does your club rank? 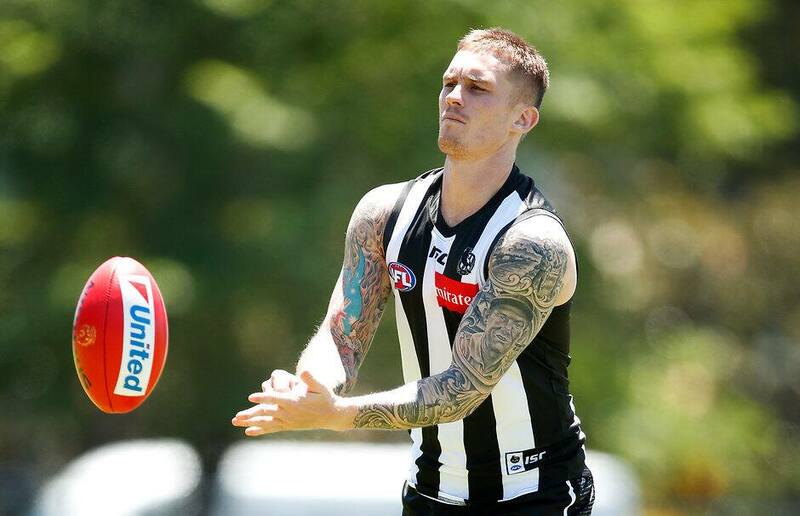 Collingwood already boasted the best midfield in the competition, and then they went and brought 2010 premiership star Dayne Beams back from Brisbane. He is yet another A-grader alongside Steele Sidebottom, Scott Pendlebury and Adam Treloar, while Taylor Adams had an unbelievable Grand Final and isn't far off that bracket and Brayden Sier is developing rapidly. Brodie Grundy had long threatened to take the competition by storm and he now sits comfortably alongside Max Gawn as the AFL's premier ruckman. Collingwood ranked No.1 for disposals and clearances, second for contested possessions and fourth for inside 50s last season, and a stacked engine room should only get better. Imagine if Daniel Wells can stay fit. Narrowly pipped as the AFL's best midfield, Richmond still boasts one of the most talented on-ball groups in the land. Dustin Martin remains one of the competition's most influential players, with his ability to also go forward just as crucial as his work out of the centre. Shane Edwards made the All Australian team last year, while Trent Cotchin, Kane Lambert and Dion Prestia are proven ball winners out of the middle. But why aren't they number one? Perhaps it's down to the loss of key depth players during the most recent NAB AFL Trade Period. A lot could rely on youngsters like Jack Graham, Connor Menadue and perhaps even Riley Collier-Dawkins should injury strike in 2019. Despite losing Dylan Shiel (Essendon) and Tom Scully (Hawthorn) in the off-season, the Giants are still loaded with talent. The centerline of Josh Kelly, Callan Ward and Lachie Whitfield – who will likely move further afield after playing half-back in 2018 – is as good as any in the competition. In Ward they have one of the toughest players going around and in Whitfield and Kelly two of the best runners and ball-users. Tim Taranto and Jacob Hopper have served a great apprenticeship, improving year on year, and will play even more prominent roles in 2019. With arguably the best ruckman going around, it's no surprise that the Demons' midfield is ranked in the top five. Max Gawn's handy work at the stoppages, combined with a midfield boasting Jack Viney and Clayton Oliver saw the Dees rank No.3 in the competition for clearances in 2018. Angus Brayshaw had a terrific season, finishing a shock third in the Brownlow, and will be integral again to Melbourne's 2019 campaign. The addition of Braydon Preuss adds some much needed depth to their ruck stocks, while a fresh start for Kade Kolodjashnij could provide another spark to the Dees' engine room. This ranking will probably irk some at the Eagles, especially after they utterly dismantled Melbourne's engine room in last year's preliminary final and matched Collingwood's vaunted unit across their three meetings. In 2018 the development of Elliot Yeo into an A-grade midfielder, Jack Redden's excellent form, Mark Hutchings' career-best season and Chris Masten's rebirth took pressure off Luke Shuey, who reminded everyone of his class with an all-time Grand Final. Throw Andrew Gaff, a Brownlow contender until his suspension, and Nic Naitanui into the mix and it is a classy unit. There is a question how deep the midfield bats but at full-strength West Coast will back themselves against anyone. Despite three of the best onballers in the competition at their disposal in 2018, the Cats admitted they were left behind the leading midfield units last year. By season's end they were ranked 17th in the competition for centre clearances per game and embarrassed 13-4 in the elimination final loss to Melbourne. While a leaner Patrick Dangerfield and skipper Joel Selwood will lead the midfield again, Gary Ablett is expected to spend more time in attack this year. The Cats have publicly called on Charlie Constable, Brandan Parfitt and Quinton Narkle to drive the midfield improvement in 2019. Retaining first-year revelation Tim Kelly goes a long way to turning the tables. Dylan Shiel alongside Dyson Heppell and Zach Merrett at the first bounce of 2019 will be a sight to behold for Bombers fans. Last year the Bombers were the highest ranked non-finalist with points from clearance differential (4.7 per game) to sit seventh overall in the competition. No.1 ruckman Tom Bellchambers faces a big season to keep in touch with the leading big men in the competition after a career-best 2018. It also looms as a big year for first-round draft picks Darcy Parish and Andrew McGrath, in their fourth and third seasons respectively, to make their mark on permanent midfield roles. While David Myers was named the Bombers' most improved last year, they'll be hoping for Dylan Clarke and Kobe Mutch to apply pressure for spots. The Bulldogs midfield boasts some A-grade starts with Marcus Bontempelli and Jackson Macrae leading the charge. In 2018, Macrae averaged the second most disposals of any player per game, behind Brownlow medalist Tom Mitchell. The 24-year-old had an elite season, and will need a repeat in 2019 if the Dogs are to set themselves for September. Tom Liberatore will be like a new recruit after missing last season with an ACL, and if he can re-discover his best, then the Bulldogs' midfield will be no pushovers. The emergence of Josh Dunkley as a onballer in the second half of 2018, gives the Dogs a little more depth in this area of the ground. They've still got some youngsters coming through the ranks who will get better with experience. One pup who is bound to get a crack at senior footy this season is father-son draftee Rhylee West. The powerful midfielder is a competitive beast and his physicality around the contest will certainly add another layer to the Dogs' core group in the centre. The Crows identified they needed more midfield class when they coughed up two first-round draft picks for Bryce Gibbs at the end of 2017, but the engine room remains their Achilles heel. Losing free agent Rory Sloane would have been a doomsday scenario last season but, thankfully for fans, he recommitted for five years. Still, Adelaide looks one-paced, lacks depth and there is a sameness about the ball-winners. With ruckman Sam Jacobs the wrong side of 30 and Brad Crouch injured all season, the Crows were the third-worst clearance team last season (-2.4 per game) and middle of the road for contested possessions. Having lost Dan Hannebery to St Kilda, a lot of responsibility rests on the shoulders of joint-captains Kennedy and Parker. They will lead a rather inexperienced onball brigade, which won't have much mature depth in 2019. Florent and Heeney could be expected to become full-time midfielders next year, with Clarke brought in to lend them a helping hand. The Swans just about broke even for clearances and contested ball last season, but could find the task of winning the ball out of the centre a tad more difficult next year. It's why they slip out of the top half of the midfield rankings. This is a midfield on the rise and could arguably be a few spots higher. Despite losing Dayne Beams to Collingwood the Lions have a great mix of inside and outside players. Lachie Neale is a fantastic addition and coupled with four-time best and fairest winner Dayne Zorko provides as good a one-two onball punch as there is. Stefan Martin is 32 but showing no signs of slowing down in the ruck, while Hugh McCluggage and Jarrod Berry will be expected to build on promising second seasons. Brisbane has now developed good depth in this department and should be the driving force for an improved season. Criticised for a lack of pace at times during 2018, the Power targeted speed at the draft with the acquisitions of Zak Butters, Xavier Duursma and Connor Rozee. They're expected to put pressure on senior midfielders who performed well below their best in the final month of last year as the Power fell out of the finals race. Ranked No.2 in the competition for total clearances after the home and away season, it was the spread from contests that let them down most. New midfield coach Jarrad Schofield has provided a fresh voice and wiped the slate clean for competition for spots. Forward Sam Gray will be hoping for more midfield time, while Justin Westhoff will also spend time on the wing. The Roos' midfield had a very different look in 2018. Jed Anderson had a breakout season, while the emergence of Paul Ahern allowed North Melbourne to spread the load more evenly. This allowed skipper Jack Ziebell to spend more time up forward, which he did with great success. Shaun Higgins and Ben Cunnington continue to pave the way in the middle, but the addition of Jared Polec should add some more support and add another dynamic to the group. In terms of depth, North Melbourne does have options. After a disappointing 2018, Luke McDonald will be looking to rediscover his best form, and has previously been earmarked for a midfield position, while youngsters Luke Davies-Uniacke and Bailey Scott are waiting in the wings for an opportunity. A midfield that has ranked among the competition's best in years gone by has diminished and is being remodelled, so losing dual Doig medallist Lachie Neale is a huge blow that will take some work to overcome. Connor Blakely seems the man to step up to support superstar Nat Fyfe, and the Dockers will need more from Bradley and Stephen Hill while Adam Cerra and Andy Brayshaw continue to develop. Aaron Sandilands will soon hand over to protégé Sean Darcy, and Freo's ruck future is in safe hands. But take Fyfe out and the engine rooms starts looking thin. The Hawks midfield is in serious trouble. AFL.com.au had previously ranked them at No.8. But as the news emerged of Brownlow medallist Tom Mitchell's broken leg, the Hawks began to slide further, and further down the order. While the 2018 season saw several young Hawks step up in the middle, far too often Mitchell was left to carry the burden. And let's face it, the best player in the competition, according to the umpires, is irreplaceable. He averaged 35 disposals per game, and it is unrealistic to think someone like James Worpel, in just his second season, will be able to fill Mitchell’s shoes. There are certainly still some good players in this starting midfield. Liam Shiels is the quiet achiever while Jaeger O'Meara made great progress last year. Veteran Shaun Burgoyne and boom recruit Chad Wingard will certainly spend game time in the middle as well which will help. But the loss of Mitchell will have a huge impact on the Hawks’ ball winning ability, and will seriously hurt their finals prospects in 2019. The acquisition of Dan Hannebery from Sydney was one of the AFL's biggest off-season moves and Saints fans will be hoping the premiership star can recapture his best form. With a strong nucleus that includes Jack Steven, ever-improving Seb Ross and Jack Steele, a firing Hannebery would go a long way to seeing the Saints rise. With a plethora of inside ball winners, the major question mark hanging over this midfield is pace, meaning another strong season from Jack Sinclair is crucial. Watch for Hunter Clark to continue improving in his second season. Carlton knew it had to improve its midfield depth and did so in the off-season by recruiting Will Setterfield, Sam Walsh and Liam Stocker. But the onball group remains light on A-Grade quality, mature talent and depth. Patrick Cripps is obviously a jet, while Marc Murphy and Ed Curnow are proven campaigners, but a lot of the heavy lifting still falls on some pretty young shoulders. Zac Fisher, Matthew Kennedy and Paddy Dow have shown plenty, but still need time to develop. It looks like a strong midfield in the making, with the right building blocks in place, but for now it remains one with plenty of potential and that's it. Although ranked last, the Suns have done a lot to address arguably the weakest part of their list. While a total rebuild will likely take a few more off-seasons, in Jarrod Witts, Touk Miller, David Swallow and Lachie Weller, a decent nucleus is there. Acquiring model citizens Anthony Miles and George Horlin-Smith should help protect younger bodies like Brayden Fiorini, Jack Bowes and Will Brodie from having to do so much grunt work. They lack speed and to a certain extent class, but the Suns should have enough bodies to rotate through the midfield to be competitive every week.